country music at its prime as performed by Mother Maybelle and The Carter Sisters with June Carter. "It's time for the Carter Sisters, Mother Maybelle, Chet Atkins and his famous guitar...[music up]... and now folks, here she is, that little rocket, ...full of words, June Carter." The radio debut of the "Mother Maybelle and the Carter Sisters" was in June 1943 over Station WRNL aired in Richmond, Virginia. After a few months, Maybelle's brother Doc Addington, and her cousin Carl McConnell (known as the Virginia Boys) joined the show. The announcer for the show here was Ken Allyn. 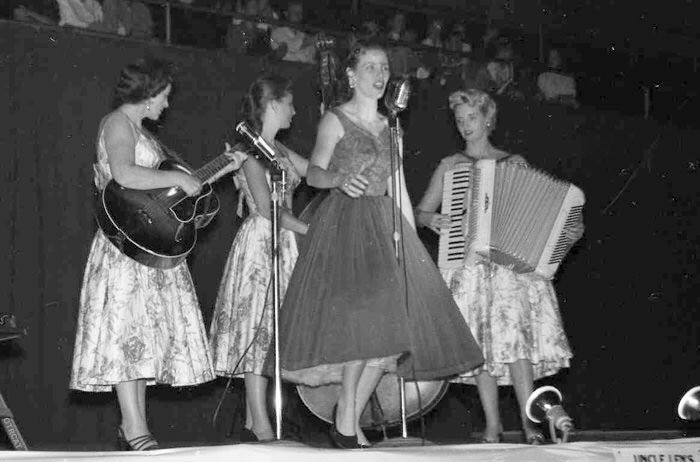 In September 1946, the Carter Sisters transferred to Station WRVA, still in Richmond, through the program Old Dominion Barn Dance of Sunshine Sue Workman. The Virginia boys was not with them anymore. In 1948, the group moved to Knoxville, Tennessee. Here, they performed in the Tennessee Barn Dance in the evenings and in the Mid-day Merry Go Round during the day. KWTO in Springfield, Missouri was the next station to host the group. Chet Atkins, an excellent popular guitarist, joined the Carter Sisters here. 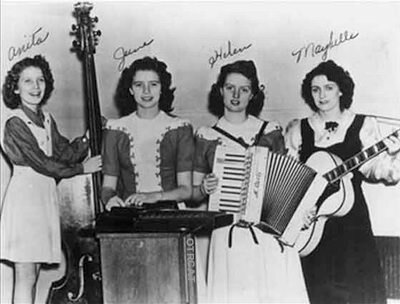 In 1950, Mother Maybelle and the Carter Sisters with Chet Atkins joined the Opry Company in Nashville, Tennessee. As part of the Grand Ole Opry for about 10 years, the Carter Sisters performed with famous musicians, such as Johnny Cash, Ernest Tubb, Carl Smith, and even Elvis Presley. After the announcer's cheerful introduction, the Carter Sisters Radio Show continues with the announcer's light-hearted exchange with funny-girl June Carter. At times, June would respond to a joke or tells it herself. Words about the sponsor follow, repeated two to three times more during the program. Some of the products endorsed include the Southern Planter Farm Journal, Martha White, and Red Star Flour. Every song performed as solo or by the quartet would then be introduced with June Carter sharing insights about the song. Chet Atkins' guitar prowess is likewise given importance in the program, with him providing accompaniment and performing solo numbers. Nice little article about them. A few more details: My father Carl P. McConnell was a second cousin to Maybelle Addington Carter and Hugh Jackson "Doc" Addington, Jr, two of ten siblings. He started playing with Doc and Sara Carter in 1932. They were dubbed "Doc and Carl, The Virginia Boys" on WHSA, Louisville, KY in 1939. They played around the western Virginia and eastern Tennessee area with Maybelle and the girls starting in 1940 after the Carter Family left XERA "Border Radio." In 1942, Doc entered the Army. My father did not pass the physical exam. When Doc returned from service they joined Maybelle and the girls at WRNL. A few WRNL transcriptions survived. Daddy and Doc dropped out in August 1946 to make more money to raise their families. Soon after Maybelle and the girls moved to WRVA and "Sunshine Sue" Workman's Old Dominion Barn Dance. Maybelle and the girls went to WNOX, Knoxville, TN where they met Chet Atkins with Homer and Jethro. Chet and Jethro were married to twin sisters. As you note, Chet and the Carters later moved to KWTO. Carter Sisters 17 Divorce C.o.d.